He brought with him his elderly mother together with his childhood nurse, Mary Beach. Demolishing one of the cottages and lodging in another possibly newly built by Vernon he built himself his villa. At the same time he obtained a licence to build a tunnel beneath the road, Cross Deep, to give access to about five acres of land which he made into his garden. This land was owned by a number of local families and some of it by Thomas Vernon. The cellars of his villa were at ground level facing the river and in the centre portion he established his first grotto. Seven years of translating Homer’s Iliad brought him both money and a delight in classical mythology. The latter, naturally enough, found expression in the creation of the grotto. Complete by 1725, he wrote to his friend Edward Blount that, having found a spring of water it lacked nothing but nymphs. These he never did find. Naturally enough, the grotto decoration extended along the tunnel from the rear of the cellars, covering up the elegant brickwork probably built by William Reeves, his neighbour. This gave rise to the misapprehension, first promulgated by Dr Johnson, that the grotto lay beneath the road. In 1732 he asked William Kent to design a portico for the river front of the villa; an essay in gentrification that provoked some asperity from his patron Lord Burlington, whom he also consulted and who wrote to him that “I have considered your front and am of opinion that my friend Kent has done all that he can, considering the place. Towards the end of 1739 Pope visited the Hotwell Spa on the banks of the Avon. He became entranced by the geology of the gorge and its colours to the extent that he resolved to redesign the grotto as a museum of mineralogy and mining. Help was sought from Dr Oliver at Bath and Dr William Borlase in Cornwall and the following spring material from Cornish tin mines was delivered, with instructions for its reassembly in the grotto. Other material was contributed over the next five years from many people. Some his friends like Ralph Allen of Bath and others who liked to think themselves so. A stalagmite from Wookey Hole in Somerset sent by a Mr Bruce and two small “joints” of basalt from the Giants’ Causeway in Ireland, given by Sir Hans Sloane, joined over 140 other mineral and geological contributions. At the end of each following season Pope claimed that he had finished his grotto, but he never did: his death intervened on 30 May 1744, nine days after his 56th birthday. He died in his villa, surrounded by friends and was buried in the nave of the Church of St Mary the Virgin in Twickenham. 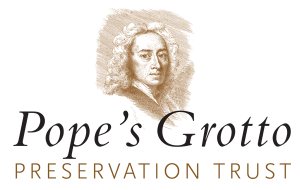 The Twickenham Museum’s website has more information on Alexander Pope and his Grotto.